When my son was about 6 years old he used to pick green beans right off the vine and eat them in the garden. As a mom I was thrilled he was getting his organic vegetables fresh as a gardener I was happy to overlook the occasional damage caused by his harvesting technique. If you are lucky enough to have a garden overflowing with wonderful stringy, snappy green beans I thought you might be looking for some fun info about them and a few ideas on how to cook up all your green goodness. Both snap and dried beans are known by the Latin name Phaseolus vulgaris. Snap beans or runner beans are healthy, high in fiber and are good sources of iron, vitamins and minerals. Pole beans can grow up to ten feet or more and bear over a longer time. Bush beans average in the two foot range and are useful in container gardens or small spaces. Open pollinated (non-hybrid), heritage or heirloom beans are easy to save from seed each year and many families take pride in their special strains passed down from generation to generation. Varieties can be green, yellow or purple, with flower colors in similar shades. Beans are reported to make good companion plants for strawberries and most other vegetables and herbs. An excellent string bean page by Grow It Organically recommends planting summer savory around green beans to repel Mexican bean beetles, flea beetles and aphids and attracts beneficial insects like tiny parasitic wasps to attack pests. Culpeper's herbal tells us that beans are ruled by Venus, the planet of beauty. Ancient Egyptians felt beans were too sacred to be eaten. Beans and pork were given as offerings and served at the festivals celebrating the Roman goddess Carna. Yet Roman priests would not speak their name and priestesses at the oracles would not let their vision be clouded by beans. Beans form part of the Three Sisters story and Native American technique of planting groups of beans, corn and squash (or pumpkins) together. The corn supports the beans, the beans help feed the corn and squash grows around the base to shade the corn and keep down weeds. Today in many parts of the world beans are eaten on New Year's Day to ensure a lucky year. Fresh green beans should be crisp and break easily when they are bent. If the green bean folds over easily it is not as fresh as it should be. It can still be used but the freshness of the bean is gone. There is nothing tastier than good fresh green bean recipes and I will give you some of my favorites. Before I get into the recipes I would like to tell you how you can freeze fresh green beans. Strip the green bean of its string and snap off the ends. Place the beans in a strainer and blanch with very hot water. Immediately place the beans in a plastic freezer bag and place in your freezer on the shelf where you would place all instant freeze foods. Preparation: Wash and remove the string from the green beans and snap off the ends. Boil or steam the green beans until cooked but still crisp. In a skillet melt the butter and add the cooked green beans. Mix well and add the almonds and salt and pepper. Mix all of the ingredients together well and on a low flame let the mixture. Cook until done but the beans are still crisp. This recipe can be used as a side dish with either meat or fish dishes and will serve four with moderate appetites. Preparation: Wash and remove the string from the green beans and snap off the ends. Boil or steam the green beans until cooked but still crisp. In a skillet melt the butter and add the cooked green beans. Cut and chop the scallions and add them to the green beans with salt and pepper. Mix well and let the mixture cook until the scallions are soft. Preparation: Remove the string and snap off the ends, snap the green beans in half, and place into a large pot adding the other fresh and canned vegetables with it. Add the herbs and place enough water to cover the vegetable completely. Cook until all of the vegetables are cooked through. This recipe is for a vegetarian vegetable soup. If you prefer a soup that is not meatless then you can use the following: _ lb hamburger plain or made into meatballs, _ lbs of beef stew cut into small cubes, or 1 large chicken breast cut into cubes. Add any one of these ingredients into the soup and cook until done. I hope you enjoy my fresh green bean recipes and will use them often. Green Bean Canning Labels; Mania or Marvelous? What began as an innocent search for an image to go with this post grew like a magic beanstalk into an art obsession and a new section of green bean designs at my Zazzle store. First I found the green beans and decided on green and blue bean sprinkles then I added a copper frying pan to the mix. The next thing you know I was whipping up a little country yellow plaid background pattern to tie it all together. Then I thought the design might look cute on stickers for homemade canning or freezer labels. Then of course I had to try my creation on a few other things and before I knew it I had a whole patch of green beans overflowing on their own page. 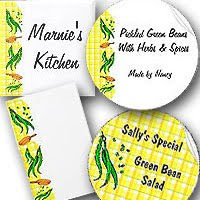 Anyway, here's my Country Green Bean Art section, at or visit my store at http://www.zazzle.com/theGardenPages* and say hello. Thanks for dropping by and happy cooking and gardening!